At CRPF's 80th Raising Day event, National Security Advisor Ajit Doval says country’s leadership capable of determining "what should be done ahead". 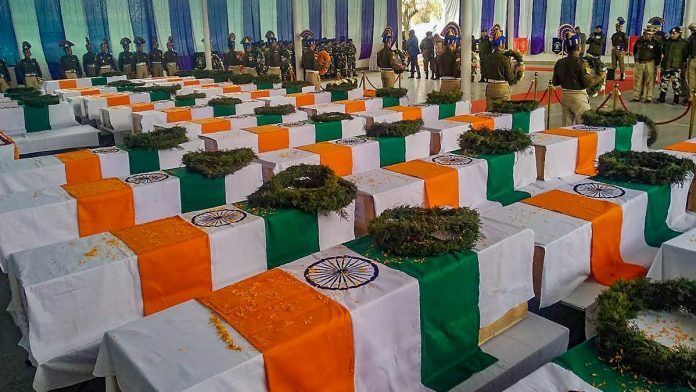 New Delhi: Paying tribute to the 40 Central Reserve Police Force (CRPF) personnel who were killed in a terror attack in Kashmir’s Pulwama on 14 February, National Security Advisor Ajit Doval Tuesday said India “has not forgotten and will never forget” the sacrifices made by Indian soldiers. “We salute the soldiers who have sacrificed their lives for the nation. The country has not forgotten and will never forget,” Doval said at the 80th Raising Day event of the CRPF. “The country’s leadership is capable to determine what should be done ahead, what will be our path, our plan of action, our target, timing and the procedure,” he added. Saluting the families of the slain personnel, Doval said the entire nation stands with them. “Today, I salute the families of those martyrs. Nothing can be done to make up for the loss but the entire nation and CRPF is with them in this hour of grief,” said Doval. The NSA praised the central force for its credibility and the reliability it has earned over the years. “During meetings while discussing deployment, we always bank upon CRPF as it is a credible force. And this credibility does not come with mere words, it takes a whole life to make it. To gain that trust,” said Doval. The NSA said a force that started with two battalions has 242 battalions today across the country. “It is the only force that has been responsible for securing over 32 lakh kilometers of borders at some time. There is no place that CRPF has not been deployed. May it be election, law and order or anything, CRPF is always there and we are proud of it,” he said. “May it be Northeast, terrorism and insurgency-struck areas, all problems where India has faced a security threat, CRPF has been there to protect, secure and counter,” he said. He said that as the NSA, he feels happy that India’s security is in robust hands. Doval added he has been associated with uniform and India’s security for the past 51 years, and an up-close look further entrusted his confidence in the force. Stressing on the importance of internal security, Doval said that after World War II, “37 countries” disintegrated or lost their independence or saw a constitutional degradation. Of the 37, “28 countries” suffered because of a failure of their internal security. Doval said the responsibility to maintain internal security lies with the Central Armed Police Forces. “There are very few examples of taking over a country through war. If a country breaks, becomes weak, its development stops, then it is because of poor internal security,” he said. “And the responsibility to maintain it lies with central armed police, so you know you have such a big responsibility,” Doval told the soldiers at the event. Was this mission successful in killing large no. Of terrorists? No. Why? Because of no confirmation from any reliable source. Now, media is unreliable, pre paid fake media card available by paying a bottle of scotch, entertainment in a club, paid for advertisement, prefer real estate plots, political postings, position slavery, something more is not printable. How is the business? The story of penetrating concrete roof exploding there after may be possible ,but keeping the roof top with the holes in tact post explosion as per photos shown as proof is farce as the roof top would have been thrown out from the explosion below. Those who question the authenticity of the IAF bombing on the Balakot Jaish terror camps don’t understand how much humiliation they are incurring on themselves by doubting the claims of our defence forces. Such Jaichands and Mir Jafars will always remain in this country. Ok. Everyone is accepting the fact of air strikes. That itself is a great thing. Further we can guess the damage by the reactions of Pakistan after the incident. At least let’s keep confidence on our air force and let all parties claim the benefits whatever they are. Yes.No Indian by heart will forget this.Till the perpetrator guy’s Head Rolls. Fortunately, Indians from all walks of life have come forward to offer financial support to the bereaved families. We pray that The Last Post will have to be sounded only very rarely.